"This is a highly nutritious and wonderful Mexican soup, called a 'caldo.' It is too dense to be a soup, and is almost a stew, except the liquid hasn't been thickened. The flavors are deep and rich. I almost never use 'cubed beef' any more, unless it's truly necessary as I think these thin slices are far better. Try this caldo, and you'll see why!" Heat oil in a medium skillet over medium-high heat. Cook and stir meat until well browned on all sides, then transfer to a large stock pot. Cook and stir onions in the same skillet in the fat remaining from the meat. When lightly browned and tender, stir in tomatoes. Continue cooking until some of the tomato liquid has evaporated, then transfer to the stock pot with the meat. In a separate skillet, brown the potatoes in a small amount of oil over medium-high heat, turning occasionally. 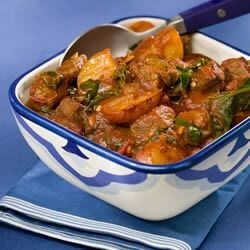 Add the potatoes to the meat, along with the tomato puree, spinach, red wine, garlic, and oregano. Add just enough beef broth or water to cover meat and vegetables, and bring to a boil. Reduce heat to a simmer, cover, and cook for one hour. Optional vegetables cut into bite size pieces may include mushrooms, carrots, zucchini, or chayote, and may be added to the soup just before covering and simmering. This is really good!! I read the reviews and decided to try adding some fresh cilantro to spice it up. The cilantro gave it the perfect taste. I will certainly make this again.